Malaysians are urged to spread positivity this Ramadan and Raya while driving donations to Pusat Jagaan Dan Pendidikan Warga Emas Darul Insyirah, in Watsons’ #MisiIkhlasAidilfitri campaign. Watsons’ campaign for Ramadan and Aidilfitri 2018 is currently running from 15 May to 2 July 2018. 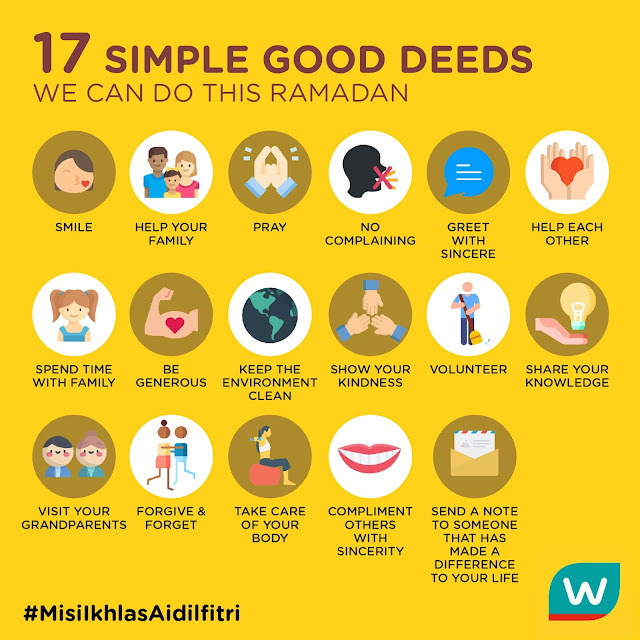 By sharing acts of kindness they experience or witness, on Instagram and Facebook with the #MisiIkhlasAidilfitri and #WatsonsMalaysia hashtags, members of the public will channel 200 Watsons points (equivalent to RM1) to Pusat Jagaan Dan Pendidikan Warga Emas Darul Insyirah for each share. With the points, the old folks’ home will be able to purchase products from Watsons, from toiletries to medicines and vitamins, for the needs of the residents. “From simple acts that can brighten the day, such as smiling and greeting the people you encounter, adopting a pet from a charity or opening the door for someone, to acts that have a much bigger impact, being kind is a practice that can have a lasting impact, besides generating positive feelings. This Ramadan, we want Malaysians to feel great, besides also looking good with Watsons Malaysia,” said Caryn Loh, Managing Director of Watsons Malaysia. Need inspiration for your #MisiIkhlasAidilfitri? We’ve prepared a handy list for you. Or perhaps, let our Malaysian personalities inspire you with their own #MisiIkhlasAidilfitri pledges. For actor Ikmal Amry, his #MisiIkhlasAidilfitri is to hug his friends and family. For actress and singer, Linda Rafar, she would like to cherish her time with her family as her #MisiIkhlasAidilfitri. For actor and YouTuber Sean Lee, he has pledged to be a better friend to his best friend Hatta Yang as his #MisiIkhlasAidilfitri. For actress and singer Sasha Saidin, her #MisiIkhlasAidilfitri pledge is to be more patient and kinder to people that she meets. That’s not all! 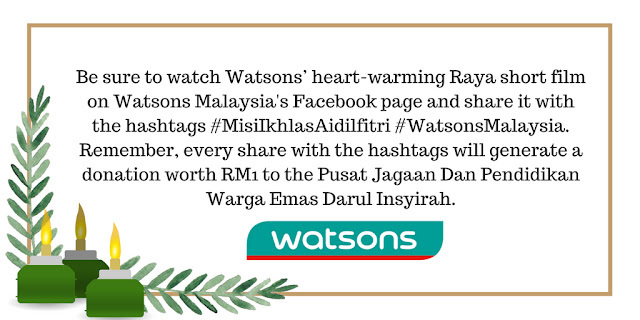 Be sure to watch Watsons’ heart-warming Raya short film and share it with the hashtags #MisiIkhlasAidilfitri #WatsonsMalaysia. Remember, every share with the hashtags will generate a donation worth RM1 to the Pusat Jagaan Dan Pendidikan Warga Emas Darul Insyirah. Will Munira truly understand the true meaning of Raya? Click here to find out!